Why would I need self storage in North Hollywood, CA? There are a variety of reasons why you might need self-storage in North Hollywood, CA. How much is a storage unit in North Hollywood, CA? The cheapest storage unit in North Hollywood, CA is $72.00 per month. What size storage units do you have available in North Hollywood, CA? In North Hollywood, CA we have sizes that range from 4'x5' to 10'x30' to suit your storage needs. How much is it for a 4'x5' storage unit in North Hollywood, CA? The cheapest 4'x5' storage unit in North Hollywood, CA is $107.00 per month. A bustling spot in the San Fernando Valley, North Hollywood is a neighborhood in East Los Angeles. The gateway to the San Fernando Valley borders Burbank, Universal City, Studio City and Van Nuys, and offers quick access to downtown Los Angeles. Here, you'll find a vibrant, diverse community with deep roots in the film and television industry. North Hollywood has long been home to television and movie stars, including past legends such as Clark Gable, John Wayne and Bob Hope. The community is still home to numerous studios and attracts a successful and highly educated population. One of the most popular events in the area, the North Hollywood Arts District Farmers Market, attracts crowds with food, performances and a variety of vendors every week. You'll find a number of parks and recreation facilities in the area, including the North Hollywood Recreation Area. Here, you can enjoy the California sunshine at several picnic areas, sports fields, a swimming pool and a playground. Or explore the NoHo Arts District, which offers an eclectic collection of coffee shops, bars, galleries and boutiques, as well as a handful of comedy clubs and local movie theaters. You can also easily access a variety of shopping, dining and entertainment options throughout the larger Los Angeles area. Businesses in nearly every sector thrive in North Hollywood and the Greater Los Angeles metropolitan area. The area's largest television and motion picture studios include Sony Pictures Entertainment, Walt Disney and Warner Bros. The North Hollywood area's major health care employers include Cedars-Sinai Medical Center, Kaiser Permanente and Miller Children's Hospital. The city has a thriving educational sector, and its largest employers include the University of California, Los Angeles, and California State University. The local economy is thriving and diverse, with several standout industries. The area's largest industries include education and health services, leisure and hospitality, trade, transportation and government. If you're hoping to find a job in North Hollywood or the larger metropolitan area, you'll have good luck in the fast-growing industries of leisure and hospitality, construction, and education and health services. The Los Angeles Unified School District manages the schools of North Hollywood and the surrounding metropolitan area. There are also many private schools to choose from, including faith-based, Montessori and arts-focused campuses. There are several higher education institutions in the Greater Los Angeles area, so you have plenty of options if you're hoping to pursue a college degree. Utilities: The major utilities companies in North Hollywood include the Los Angeles Department of Water and Power, Southern California Edison and Southern California Gas. Garbage and Recycling: The city facilitates regular collection of trash and recyclables. 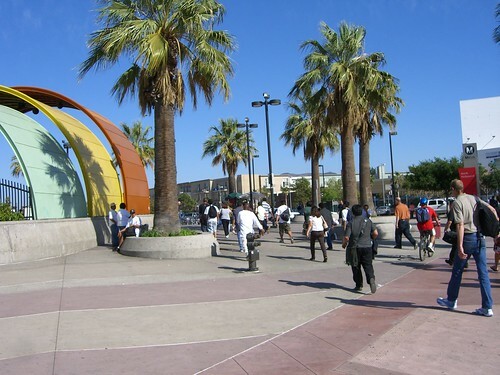 Transportation: As a neighborhood of Los Angeles, North Hollywood is well-connected to the surrounding metropolitan area via public transportation. Bus is one of the most popular options in the area. A neighborhood in and of itself, North Hollywood offers slightly more affordable housing than other parts of Los Angeles, along with easy access to the entire metropolitan area. If you're seeking quick connections to the rest of the Valley or Los Angeles, look for homes near the 170 freeway or Interstate 5. Like most of the Los Angeles area, North Hollywood's median home price is considerably higher than in other communities in the U.S.
Our lowest priced units in North Hollywood, CA average $96.25 per month. 757 people have reserved units in North Hollywood, CA in the past 30 days. There are 12 locations within North Hollywood, CA's city limits. There are 3 locations in North Hollywood, CA that offer AC and Heating features.